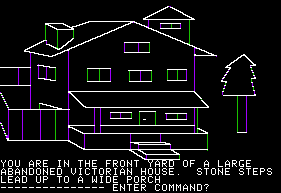 I’d like to expand my choose your own adventure game into the text based adventure games of the early personal computing age. Much like Mystery House which took me a lot of hours to complete and even got the help of my entire family since this was on the Apple IIe, our first computer in 1983. I’d render the text on just a plain black background and see if it will work using a CSS stylesheet and text input. The story would be a mystery for the player to solve. More to come.